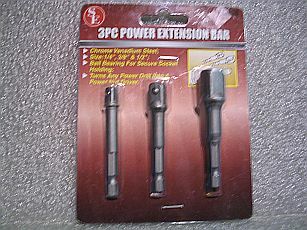 This is a 3 pc power extension bar kit. These power bars are used to turn a power drill into a power nut driver. Made of Chrome Vanadium Steel, includes sizes 1/4", 3/8", and 1/2"
Shipping weight for this item is one pound.